I mentioned nearly a month ago that we were busily preparing for the kiddo’s birthday party, but I just got the pictures uploaded, so I’ll show you what we did. We wrapped all of the tables in brown craft paper so the kiddos could color on the tables while they were eating or crafting (we made monkey puppets out of brown paper bags and they colored them, but somehow I missed photographing that!). It is tradition in my family to make two cakes for a first birthday party. A big one for the grown ups and a little one that the birthday boy got to keep to himself. 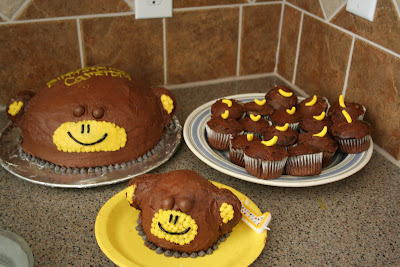 The cake was banana and chocolate with chocolate icing. I made the cupcakes as I thought they would be easier for the kids. Oh, and a great tip that I borrowed from another party we attended, I pre-scooped the ice cream into cupcake baking cups. When it was cake and ice cream time, noone was stuck scooping ice cream, we just set them out on the table for people to help themselves. I can’t take credit for this bit of craftiness. My friend Chavaun made the trees out of paper grocery bags! She also made banana garland to go over the door! That’s the husband and my friend Kate in the picture. 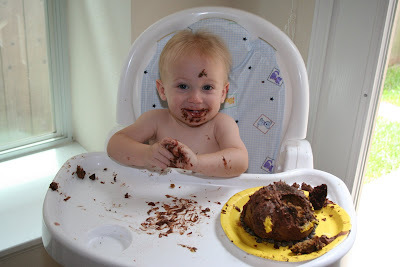 Here’s the kid in the cake aftermath. Needless to say, we just put him straight in the tub. 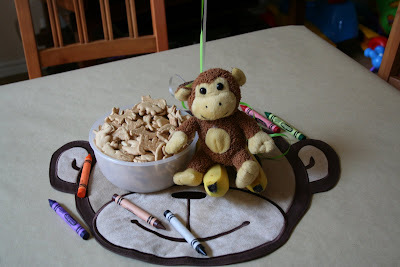 There were lots of other things, too, like cups we decorated to look like monkeys and the adult party favors, banana bread starter kits in brown craft paper bags with little monkeys on the front. 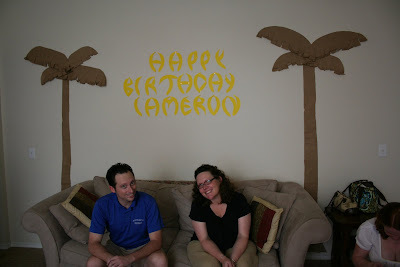 It was a fun party with lots of people that we love and a bunch of little touches to make it unique! Next year, though, we’ll be doing things on a smaller scale. The race was great, thank you for the good vibes! oh, SO CUTE! I love the monkey theme! That pic of Cameron with the cake all him is the cutest ever. SO CUTE! And Happy Birthday to the Beastie!!! Happy Birthday Cameron you little monkey! Very cute party and pictures! What a party! Looks like you had fun. Happy Birthday! What an adorable monkey theme. Great work.